Score 50000 points to complete the level. This level is again hard and the candy board have 25 chocolates that are corner in board and have 21 meringue blockers. You should try to break chocolates all first and then try to break meringue blockers to get more chance to play with candies and can make easily special candies. You should try to increase moon power with balancing the Owl and as moon will struck will break more same color candies that will help to get more special candies that you should combine to each other. 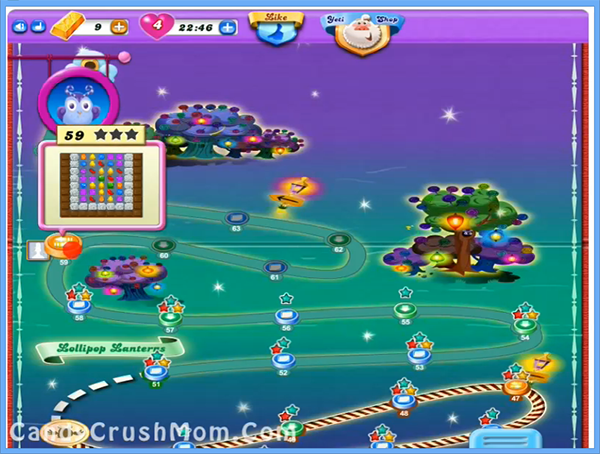 We completed this level with 64880 score by making more special candies and that help to reach score within moves.